Are you often frustrated with your exfoliation routine because you thought that it works immediately, but after one or two days your skin cells build up again and you start to see your skin looking tired and dull? Or have you noticed the peach fuzz on your face and wished that you could get rid of it and the dead skin cells on your face at the same time (for the perfect exfoliation)? What is there that would make your skin glow and look absolutely perfect? Well, there is a device on the market that does this all of this. This device was designed for the delicate skin on a woman’s face and was created by a woman for ALL women. It is called DERMAFLASH 2.0 LUXE. NEW BEAUTY named this their award winner for 2018. Allure also gave them the coveted Best of Beauty Award for 2018. DERMAFLASH 2.0 LUXE uses a form of dermaplaning technology to remove the peach fuzz hair and top layer of dead skin cells from your face and neck to reveal smooth, soft skin that looks and feels amazingly beautiful. Based on the dermaplaning technique used in salons and physicians offices, it is a technique that is a non-invasive exfoliating facial treatment. It uses patented and patent pending technologies to restore skin to a more radiant youthful complexion. This ingenious alternative to microdermabrasion and dermaplaning is gentle to use and gentle to the skin. It is an ergonomic beauty tool that gently clears away dull surface cells, built up debris and peach fuzz. All you need are three simple steps: 1. PREP. 2. EDGE. 3. SOOTHE. How does it work? DERMAFLASH 2.0 LUXE transforms the look and feel of the skin by creating a beautifully soft and smooth canvas for skincare and makeup. It can even be used on the most sensitive of skins. The DERMAFLASH Edge is enhanced by subtle sonic vibration and is always used dry, never wet. It is a safe and effective medispa-inspired system for use in the privacy and comfort of your own home. In 15 minutes you will see and feel the results immediately after the first use. To use: Prep the skin with with PREFLASH cleanser. This cleanser is designed to cleanse the skin and remove any surface oils that would hinder the device from working. Then use the EDGE. A brand new EDGE is used each time you use the DERMAFLASH 2.0 LUXE. This is so that you get the best results from the device and because the EDGE is not meant to be used more than one time. The EDGE is taken across the face in short bursts, you pull the skin taught and pull the EDGE downward across the face getting rid of the peach fuzz, dead skin cells and debris all at once. Then you use the POSTFLASH hydration lotion afterwards to leave the skin soft, supple and protected. Skin is left feeling nurtured. Make sure to repeat weekly for optimum results. The kit contains the following: Charging Base, Power Supply Cord, Owner’s Manual, Quick Start Guide, PREFLASH 10 mL/.33 fl.oz., POSTFLASH 10mL/.33 fl.oz., 6 EDGES. It comes in five colors: White, Pink, Navy, (new) Hot Pink and Blue (as seen on TV). 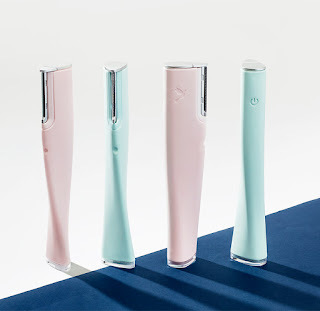 After great success with their first device, DERMAFLASH decided to upgrade it to a new device that is actually not only easier to use but works better and gives a better exfoliation. NEW DERMAFLASH 2.0 LUXE instantly removes dead skin cells, built-up debris and that pesky peach fuzz. The device was designed for the delicate skin on a woman's face and can be used by any skin type, except those with extreme acneic skin, such as those with active pustules. DERMAFLASH 2.0 LUXE enhances the power of skincare products by erasing the barrier to penetration, all while creating a flawless canvas for makeup. It instantly reveals a smooth, radiant younger looking skin. As you can see, the older device was different to hold onto and a little bit different to use. They both use sonic vibrations but the new device is much effortless to use, as it is easier to hold and actually more manageable to use on the face. I think the new DERMAFLASH 2.0 LUXE version gives a better exfoliation as it works much better and is so much easier to hold than the previous version (as mentioned above). I find it is much more simple to hold onto the skin and pull down on the device than with the older one. I personally feel the newer version is just of a better quality product than the previous one. It is similar to a razor and the device actually has a razor in it that is protected by a guard. The blades are meant to be used only one time, as they get dull very easily and would not work well more than one time. They are easy to get in and out. Just pull them out and then use the EDGE kit to put one it, it is as easy as 1,2,3. You can see that my skin has more radiance and luminosity than prior to using the system. It looks smoother and to me it felt softer than prior to use. Also, the peach fuzz and extraneous dead skin cells were gone. I loved the way it made my skin look. Refills for the PREFLASH, POSTFLASH and EDGE are sold in a kit called the ESSENTIALS. The ESSENTIALS retail for $29.00 and include the following: a tube of PREFLASH, a tube of POSTFLASH and four EDGES, enough to last one month. The DERMAFLASH ONE is a special offer that was featured on television and is three payments of $49.95. It features the DERMAFLASH, PREFLASH, POSTFLASH AND 4 EDGES. It comes in the color blue. What is my opinion on the DERMAFLASH 2.0 LUXE? I absolutely LOVE using this device. This is a great exfoliation option in my opinion. I love how it made my skin so smooth and soft. And I love how my 'peach fuzz' facial hair was gone. I don’t mind repeating this weekly because it literally takes off the outermost layer of skin with the facial hair, which is the equivalent of a salon level peel. It does this without any irritation, peeling of the skin or bleeding. The DERMAFLASH 2.0 LUXE is safe and effective, and can be used by just about anyone. As mentioned previously, the only people I would not recommend this for is anyone with persistent pustulent acne. It you have massive breakouts, this is not a good choice for you at the moment. Wait until the breakouts have cleared up. Otherwise this can be used by anyone with even the most sensitive of skins. The DERMAFLASH 2.0 LUXE is a great exfoliation option that can replace irritating peels and is especially good for those who cannot tolerate peels. Once you purchase the device, it is yours and you do not have to upgrade. The only thing you need to purchase is the ESSENTIALS kit once a month, which for $29.00 is a steal for a great salon level exfoliation. DERMAFLASH 2.0 LUXE retails for $189.00 and can be purchased online at www.dermaflash.com. Like DERMAFLASH on Facebook: https://www.facebook.com/dermaflash/; Follow DERMAFLASH on Twitter: @DERMAFLASH; Follow DERMAFLASH on Pinterest: https://www.pinterest.com/dermaflash/; Follow DERMAFLASH on Instagram: https://www.instagram.com/dermaflash/ and Subscribe to DERMAFLASH on YouTube: https://www.youtube.com/channel/UC_z6NCz846fMLFWDM-HS4FA.